In November, the Camp Fire in Butte County and the Woolsey Fire near Los Angeles together killed at least 90 people, burned more than 250,000 acres, destroyed more than 20,000 structures and generated unhealthy air conditions in communities hundreds of miles away. The fires also gave Stanford faculty much to consider as they look ahead to a hotter, drier climate and the possibility of even more destructive fire seasons in the future. We asked experts in health, climate change and public policy to discuss what they learned from this fire season, how the fires influenced their research objectives and ideas they have for fire prevention. The recent fires highlight the growing risks in California and the American West. Many of the recent fires in California have occurred with record or near-record combustible material that have been elevated by hot conditions. Decades of research show not only that the area burned in the West has been increasing, but also that global warming has been playing a role by increasing the dryness of vegetation on the landscape. The National Climate Assessment that was released by the U.S. government the day after Thanksgiving confirmed this evidence, highlighting that global warming has been responsible for around half of the historical increase in area burned. With regards to the conditions in California over the past few years, it is clear from multiple lines of evidence that California is now in a new climate, in which conditions are much more likely to be hot, leading to earlier melting of snowpack and exacerbating periods of low precipitation when they occur. The net effect is an extension of the fire season and greater potential for large, intense wildfires. A key research question going forward is exactly how much the odds of the record-setting conditions that we have just experienced have already been elevated, and how much further they will be elevated in the coming years as global warming continues to unfold. While we have been investigating the impact of air pollution and wildfires on health, the main focus previously for us and others has been on the health consequences for those relatively close to the fire. The Camp Fire, on the other hand, highlighted the massive impact that wildfires can have on those over 200 miles away. As a result, our center (The Sean N. Parker Center for Allergy and Asthma Research) collected biomarkers (for example, blood and saliva) from Bay Area residents during the period of increased smoke exposure from the Camp Fire. We will re-collect biomarkers from the same subjects in one month, when the air quality has been at the typical low levels for several weeks. Our goal will be to look for differences in immune function during the two time periods to help determine the health implications for those exposed to the wildfire smoke in the Bay Area and, potentially, whether wearing a mask during the wildfire smoke altered immune outcomes. These are important questions, as the immune system is not only involved in fighting infections but is key for immunity, autoimmune disease, allergy, asthma, cancer and other diseases. State legislators responded to the catastrophic 2017 wildfire season with bills that proposed to increase fuel treatments around California through timber thinning and prescribed burns. Gov. Brown issued an executive order in May to establish training and certification programs for prescribed burns and to double the number of actively managed acres in California through thinning, prescribed burns and reforestation. The long-term effects of this executive order and the new wildfire legislation from the 2017–18 session have yet to be seen. The devastating 2018 wildfires place greater urgency on the need to respond to California’s wildfire problem. Both of these wildfire seasons affected rural and urban areas and also hit Northern and Southern California, increasing interest for action from legislators beyond those from traditionally rural or forested districts. Governor-elect Gavin Newsom has already declared wildfire planning to be a priority of his administration. Looking ahead to the 2019–20 session, wildfires will likely be a major topic of proposed legislation and executive action. There are dozens of communities in California and in the rest of the western United States that are at risk of a catastrophic fire in a similar way as Paradise, California, and we need new strategies and technologies to proactively protect them instead of being limited to reactive suppression efforts. While my lab has been focusing on developing a new fire-prevention technology to be leveraged in these high-risk areas, complementary efforts are needed to (1) identify these high-risk areas and (2) fund projects to leverage new technologies for fire prevention. On the first point, three factors crucial to identifying high-risk areas are: (1) where do fires happen (exact latitude and longitude), (2) how do they happen, and (3) total number of starts per year. The current post-fire reporting that fulfills federal, state, county and city filing requirements most often lacks critical details such as the exact coordinates of where the fire originated (these are often simply placed at the nearest road intersection). 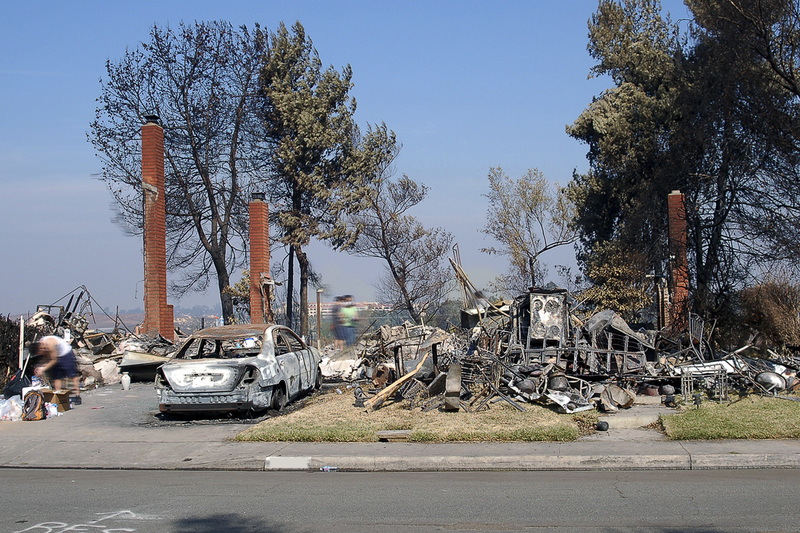 Moreover, post-fire investigation is often unable to determine any obvious culprit and the cause of ignition is reported with the exceedingly unhelpful “undetermined” designation. Furthermore, only fires larger than 10 acres are typically reported to the Fire and Resource Assessment Program and are searchable on the state database, but this excludes thousands of fires, many of which could have grown to be catastrophic if conditions on the day were different. Therefore, in order to identify high-risk areas that are burning year after year and draining local, state and federal agencies of their resources, we find ourselves relying on the memories of fire professionals to determine where, how, and how often fires occur. On the second point, a large Cal Fire (California Department of Forestry and Fire Protection) grant RFP (request for proposals) is now open for large prevention-oriented projects, but applications are due in mid-December, posing a massive hurdle for the various fire-related agencies in each district – considering that many are still engaged in recovery efforts. Moreover, we have seen that proposals for fire prevention efforts in very high-risk areas in several counties in California have not been funded, despite the fact that these areas routinely have dozens of ignitions per year. One example project is along a highway in Ventura County, where a proposed project to protect the roadside for the 2018 fire season was not funded on this mechanism and the district suffered numerous fire starts and one large 160-acre fire this year that all originated on the side of this road. Worst of all, the large fire occurred while the Woolsey Fire was raging. (It wasn’t started by the Woolsey F­ire). Further, this RFP is one of the first major investments in prevention. Most of the available money is specifically slated to support reactive fire suppression efforts and very few funds are available for proactive fire prevention efforts. It seems what we really need is for legislators to green-light funding of prevention efforts in each district statewide so these agencies have the ability to protect their own high-risk areas right now, without having to cross their fingers and hope they get awarded a grant to protect those areas year after year. The Stanford Climate and Energy Policy Program has been working with California legislators since the 2017 wildfires to help them better understand the root causes of destructive wildfires and to take legal and policy steps aimed at reducing risks and creating greater safety for California. This work culminated in framing key issues and the legislative approaches taken by the legislature in the 2017 session. The Camp and Woolsey fires have reinvigorated this legislative conversation and the Climate and Energy Policy Program is again working with stakeholders to identify potential solutions and perform the necessary analysis to fully develop and vet them. These efforts engage students and faculty from a variety of disciplines across campus including law, business, engineering and the natural sciences. The loss of life and destruction from this year’s California fires is record-breaking and tragic. The danger continues even hundreds of miles away for people breathing smoky air across the state, including the San Francisco Bay Area and Los Angeles. Earlier this year, a paper in the Journal of the American Heart Association showed how fires in California in 2015 sent more people to emergency rooms for cardiovascular problems, including heart failure and stroke. More shockingly, recent research at the California National Primate Research Center has shown the effects of being outdoors and breathing sustained, smoky air is particularly damaging for primates younger than three months of age – and lasts for years. Smoky air affects us all, but our young and our old are the most vulnerable by far. Our work on droughts and fires highlights some of the increased risks observed today. Our work on changing fire regimes, including fire suppression and controlled burns, provides opportunities for reducing some of them. For more faculty who study climate, health and policy related to wildfires, see Stanford’s wildfire experts list .